The story of a country boy training to be a new paratrooper at Fort Bragg. Eddie Slocum is a wet behind the ears kid who ahs dreams of becoming a paratrooper just like his Uncle Charlie. During training Eddie meets a doe-eyed country girl by the name of Jenny May. Nice movie. 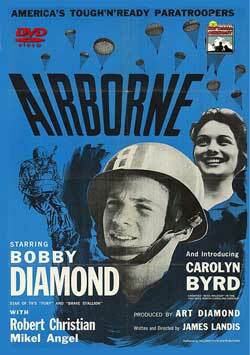 Starring Bobby Diamond, Robert Christian, Carolyn Bryd. 1962 – BW – 80 Minutes.